Last week, I received a couple of samples from online beauty haunt, MyBeautyEmporium and one of them caught my eye instantly. Priti NYC is a nail polish brand that have been around for a couple of years and I remember they caused some controversy back in the day when it was revealed that their collection (allegedly) consisted entirely of repackaged Diamond Cosmetics nail polishes. For those of you who aren’t aware, Diamond Cosmetics are an inexpensive brand who offer a private label division for just such a thing. There’s nothing wrong with this, nothing at all. Private label cosmetics is a huge market and a huge amount of the cosmetics we buy aren’t made by the company on the label. So what’s the issue? Well, the problem was that Diamond Cosmetics polishes retail to the public at less than half the price of Priti NYC polishes. 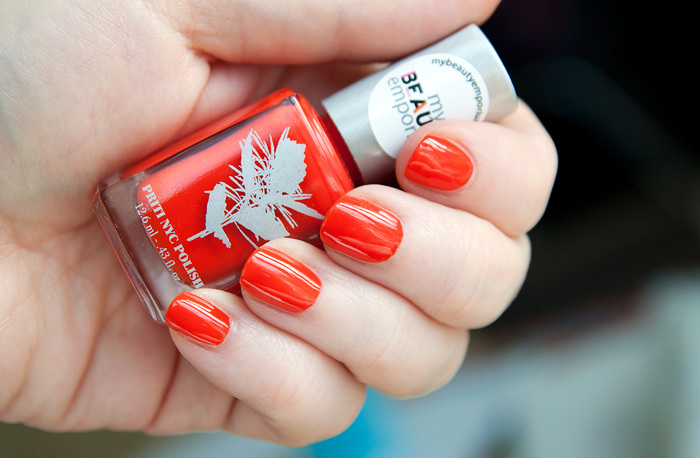 The blogger Polish or Perish wrote a post on which polishes from the two brands crossover so-to-speak. It would be foolish to spend more on an identical polish no? Well, this isn’t really an issue for us in the UK anymore. With the new Royal Mail restrictions, we’ve never been more of an island than we are today. The only UK retailer of Diamond Cosmetics polishes packed up her online store a couple of years ago and if you want to get hold of some of the stunning polishes that DC used to offer… Priti NYC may be the only way you can achieve this nowadays. If you haven’t already discovered the brand for yourself, I really recommend you pick up Lambstail Cactus – a beautiful, scattered holographic charcoal black. Snapdragon* shown above is also a bit of a Summer must-have with it’s warm opaque-in-just-one-coat, jelly-esque squishiness that reminds me of a Jolly Rancher. No top coat in that picture by the way. Opaque in one coat, loving the sound of that!